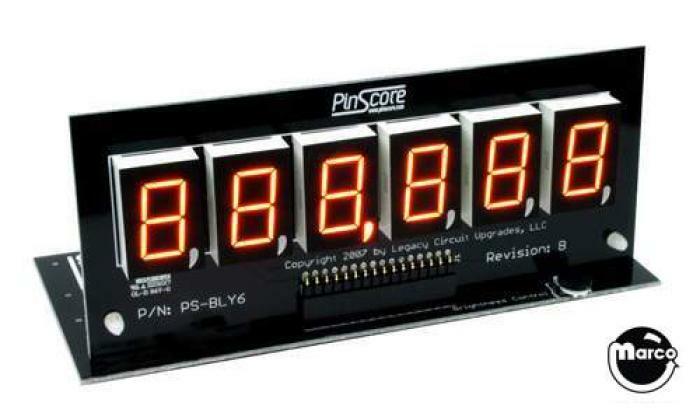 "PINSCORE Display 6 Digit Bally / Stern" has been added to your cart. New PinScore™ Display systems for pinball machines and shuffle alleys are efficient, economical and easy to install. Brilliant design makes old high-voltage glass displays obsolete. Plug & Play installation - no soldering or modifications required. Includes light shields and mounting hardware. PinScore Model PS-2518-21 replaces the original 6 digit display module Bally part #AS-2518-21, Bally AS-2518-15, Stern A-434, Stern DA-100, and Stern A-472 (credit/match display). 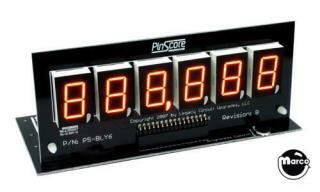 PinScore 6- & 7-digit display modules are a Plug & Play replacement for each plasma module. Reference the chart below for the number and type of modules needed for your machine. For most games, PinScore combo kits are available that include the correct quantity and type of PinScore modules used by your machine. Documentation and more information can be found at the PinScore website. I absolutely love these displays and I would definitely recommend them to any pinhead with any of the games listed above. They look great and they were easy to install. Switching to LED displays will prevent your machine from working as hard and running as hot. You can also remove the jumper if you would like to get rid of the commas.